If you are looking for a more atas treatment, go for gold. By that, we mean the Korean Luxury Gold Therapy that is as luxurious as its name suggests. For one, the products used are infused with real gold. From the ampoule to gold foil, massage cream and mask, your skin will be pampered with the precious metal at every step of the way. This Korean Luxury Gold Therapy not only helps to remove heat metals, which improves your skin tone, but also detox and brightens dull skin. helps promotes cell activation, elasticity, anti-aging while giving nutrition to the skincare. 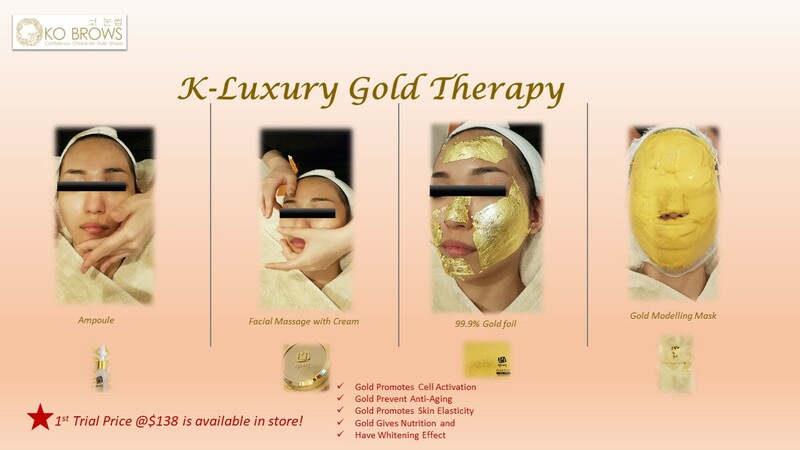 Korean Luxury Gold Therapy helps to remove heavy metals in the skin to improve skin tone, detox the skin, as well as having whitening effect! It is especially effective for aging, dry and dull skin. *1st Trial price is available. Contact us today to know more! At KO BROWS we are providing comprehensive Korean Semi Permanent Makeup services And Skincare Services. Our Beauty Specialists comes with years of experience in the field and our products carefully selected to suit Asian complexion. We will also be using the latest technology and equipments and will be constantly updating ourselves with the beauty trend. KO BROWS provides personalized consultation and skin analysis as well as having comfortable private treatment rooms in which customers will be able to relax and leave it to us to deliver our best services to them. We pride ourselves in providing quality services to our customers. Read up on our reviews by our satisfied customers. Visit our Facebook for more information. Come and experience KO BROWS today!